English strawberries and a glass of chilled champagne – what a perfect accompaniment to a Wimbledon final. To be honest, it was hard to find any strawberries left by the slugs in the garden and I was only drinking Cava, but I was determined to join the rest of the nation in its patriotic fervour. I tried explaining to Jo why it was such an important day for this most English of traditions, the first time “we’d” reached the men’s singles final since 1936. “Isn’t he the same guy who lost last year?” she asked, rather dispiritedly. “Not for long”, she said. “With his sense of humour, he’s bound to be Scottish Nationalist.” She’s learning fast about British politics. "The BBC will have a massive audience today,” I said, changing the subject: “I bet the streets will be empty”. That decided it: Jo and Izzy went shopping, leaving me and the dogs to support our hero. The TV coverage opened with shots of an empty stadium and a sound track listing every British sporting triumph in history. It lasted nearly a minute: “They think it’s all over – it is now; Red Rum has won the National; It’s coming back for Jonny Wilkinson, he drops for world cup glory; He’s the Olympic champion, this man’s unstoppable”. After this emotional montage, Sue Barker was quite misty-eyed. She was with two real champions, Pat Cash and John McEnroe, sitting either side of Britain’s previous tennis also-ran, Tim Henman. Outside the window, hundreds of drenched fans were sitting on top of his Hill. Or Murray’s Mount as it will henceforth be known. The BBC scriptwriter must have had an off day. Barker’s opening link went: “For one it will be a fairy tale ending; for the other, heartbreak.” Not totally heartbreaking, despite his tears – Murray is richer by £575,000 this morning. John Lloyd was confidently predicting a Murray win: he was in a minority of one. As the VIPs arrived, Sue Barker was rather overwhelmed by the sight of Victoria Beckham dressed in the colour of a Centre Court seat. Moments later she announced that “the first minister of Scotland Sir Alex Ferguson has been spotted arriving.” She didn’t see her old beau Cliff Richard, who was sporting a strangely patriotic duvet cover – a kind of union jacket. “The world is waiting – for history”, said the BBC. 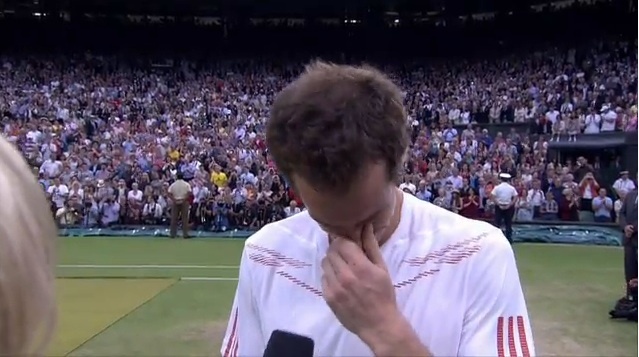 So David Cameron put a Scottish flag on top of Downing Street and announced Murray had the whole nation behind him. I poured myself another glass of Cava and watched Murray win the first game – thanks to a decision from Hawk-Eye. I was proud that my previous company, The Television Corporation, owned and developed Hawk-Eye. It’s based on some secret missile technology, which we invested in when we were doing the cricket coverage for Sky. We tried for years to get tennis to take it up – now you can’t imagine a major game without it, and at long last they’re bringing it into football. At first the crowd got excited while Murray knocked Federer all round the court – until half past two when the skies darkened and Federer finally found his game. Then Andy hung on while Victoria Beckham looked bored and pouted. The camera spotted mayor Boris Johnson in the crowd. “That’s a great first name for tennis”, said John McEnroe. That’s not the only connection with Becker, I muttered. His BBC colleague Andrew Castle agreed, saying he and Boris Becker have the same dodgy hair. That wasn’t quite what I meant. By the time the girls returned, Murray had won his first ever grand slam set and the crowd were going mad. Then the skies darkened again and Federer was ahead. Izzy sat quietly, watching two men endlessly hitting a little ball over a net and asked if we could put Cinderella on. I asked her if one day she’d like to play tennis like them. “That's about as likely as a Brit winning Wimbledon”, said Jo, as Murray’s game faded into history.